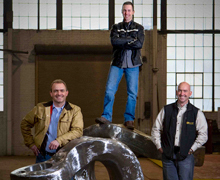 Bay Cast is the complete global solutions provider of heavy-sectioned finished steel castings, large-format precision machining services, and industry-benchmark base, floor, and surface plates. Industries that we serve include; oil and gas, hydro-electric, pumps and valves, aerospace, construction and mining, injection-molding, and stamping, as well as test, measurement and machine tool—to name a few. Using modern, state-of-the-art manufacturing equipment and processes, our three integrated businesses—Bay Cast Inc., Bay Cast Machining, Bay Cast Technologies, and Employment—are efficiently providing stand-alone or turn-key services and products for our customers’ needs. For additional information regarding our comprehensive services and capabilities, please contact Bay Cast.